Landmark Pine Condos, Ann Arbor is a small community of 10 townhouse style units surrounded by mature trees for added privacy. 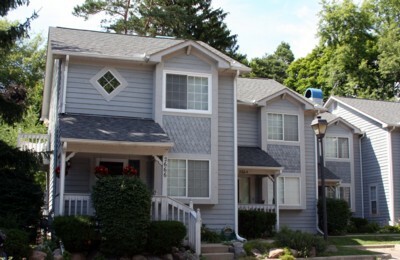 The southeast Ann Arbor location is convenient to Briarwood Mall, downtown Ann Arbor, area freeways, and much more. There are currently 0 units listed for sale and 0 units have sold in the last year. Due to the small size and popularity of Landmark Pine, condos rarely come up for sale. For instant notification of new listings at Landmark Pine, or the nearby Alpine Condos, Georgetown Commons, or Woods of Ann Arbor, contact the real estate experts at The Bouma Group today at 734-761-3060 or info@bouma.com. For up-to-the-minute listing and sold data, be sure to check out the Ann Arbor Condo Hotline, Washtenaw County’s #1 resource for condo information!